Sleep can be hard to come by for some of us. With about 9 million Americans popping pills for better sleep at night, insomnia has become a major issue. And that’s not including the millions of Americans who have difficulty sleeping and aren’t taking sleeping pills. This sleepy time lotion though uses a relaxing blend of essential oils and magnesium to calm the mind and promote restful sleep. Magnesium is necessary for over 300 biochemical reactions in the body, including nerve transmission and function. Without adequate levels of this mineral, insomnia or general restlessness can often result. Magnesium is naturally occurring in certain foods, however due to soil depletion, sugar consumption and poor diet, the majority of us don’t have enough. Applying magnesium topically on the skin is a good way to supplement, as only 30-40% of consumed magnesium is actually absorbed by the body. 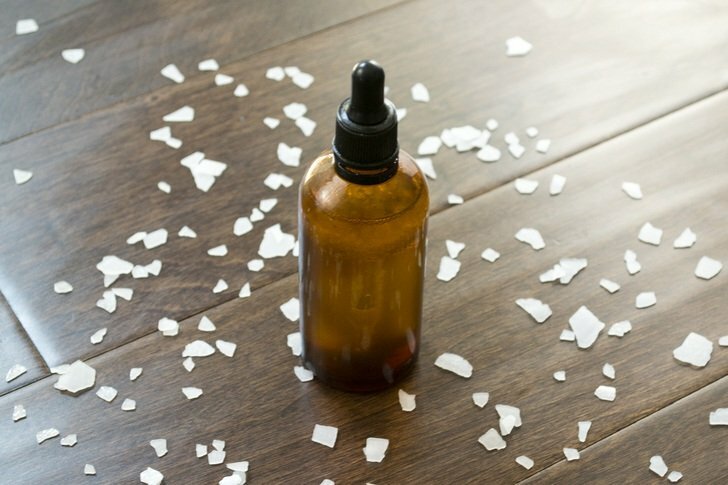 Homemade magnesium oil is known to sting the skin a little, especially on the first few applications. By combining this with coconut oil though, it further moisturizes the skin and helps prevent the characteristic stinging. You can make your own magnesium oil using our simple recipe here and we also have a great recipe for making your own magnesium rich sleep spray here. Citrus essential oils are known to be uplifting and invigorating, so you may be surprised to see one used in a sleepy time lotion. Mandarin essential oil however has been shown to promote restful sleep. It’s commonly used with children, making this lotion a good option for all ages. One of the most popular and most studied essential oils, lavender is well regarded for its ability to relax and calm. It’s also one of the most gentle oils and frequently used for young children. A review of essential oils for sleep was published in the Journal of Alternative and Complementary Medicine. The researchers found that lavender was the most studied essential oils for sleep issues, and no adverse events were reported. Clary sage is similar to lavender in its effects, though the smell is often described as more pungent. This essential oils is calming and sedating to the nervous system, and helps to relieve stress and anxiety. Anxiety and nervousness can impede a healthy night’s sleep, making clary sage the perfect antidote. Place the magnesium flakes into a small bowl. Heat the water or hydrosol until it’s simmering, then pour this over the magnesium. Stir the mixture for several minutes, or until thoroughly dissolved. Place the coconut oil and beeswax into a saucepan, then melt over very low heat just until completely melted and combine. Pour the oil mixture into the blender, and put it in the fridge for 15-20 minutes. You want the oil to be opaque, firmer, and about the consistency of mayo. Don’t let it get hard! Turn the blender onto medium speed, and very slowly drizzle in the magnesium water while the blender or mixer is running. Continue mixing the ingredients for about 30 seconds after all of the magnesium water has been added. Use the spatula to scrape the lotion into the glass jar. Store away from direct light and heat. Apply this lotion liberally before bedtime. It works even better if applied to the torso or feet. The coconut oil may take a while to sink into the skin, so apply at least 10 minutes before hopping under the covers to avoid greasy sheets.